Along with papers, finals, and the comp, five Allegheny seniors can add a stint on reality television to their list of accomplishments for the year. Beginning its second season, Explore PA gives viewers the opportunity to explore the state’s cultural and historical resources. Each week, host Elizabeth Jennings travels the state with real-life people as they learn about historic battlegrounds, heritage sites, scenic parks, quaint small towns, museums, and other sites. 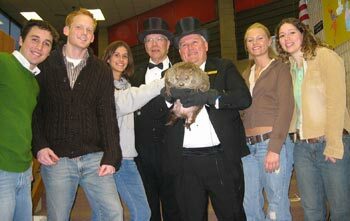 Groundhog Day was only one part of the Allegheny group’s itinerary. In three days of taping, the students also participated in several other activities, including carving an ice sculpture, joining in a lumberjack tournament, and visiting the Jimmy Stewart Museum. The group agrees that the most surprising part of the experience was how unreal “reality television” is. “A lot of what we did was somewhat staged,” says Lasser. “If we said something that the producer liked, she would ask us to say it several times to get the best take.” The show aired this summer, and the students planned to watch it together to see how the finished product compared to their perspectives. This article was featured in the Spring/Summer issue of Allegheny Magazine.